This study evaluates the sensitivity of aquatic life to sodium bicarbonate (NaHCO3), a major constituent of coal-bed natural gas-produced water. Excessive amounts of sodium bicarbonate in the wastewater from coal-bed methane natural gas production released to freshwater streams and rivers may adversely affect the ability of fish to regulate their ion uptake. The collaborative study focuses on the acute and chronic toxicity of sodium bicarbonate on select fish species in the Tongue and Powder River drainages in southeastern Montana and northeastern Wyoming. Sodium bicarbonate is not naturally present in appreciable concentrations within the surface waters of the Tongue and Powder River drainages; however, the coal-bed natural gas wastewater can reach levels over 1,000 milligrams per liter. Large concentrations have been shown to be acutely toxic to native fish (Mount and others, 1997). 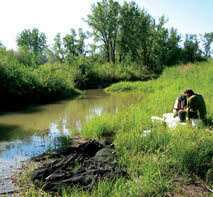 In 2003, with funding and guidance provided by the U.S. Environmental Protection Agency, the Montana Fish, Wildlife, and Parks and the U.S. Geological Survey initiated a collaborative study on the potential effects of coal-bed natural gas wastewater on aquatic life. A major goal of the study is to provide information to the State of Montana Water Quality Program needed to develop an aquatic life standard for sodium bicarbonate. The standard would allow the State, if necessary, to establish targets for sodium bicarbonate load reductions. Mount, D.R., Gulley, D.D., Hockett, J.R., Garrison, T.D., and Evans, J.M., 1997, Statistical models to predict the toxicity of major ions to Ceriodaphnia dubia, Daphnia magna, and Pimephales promelas (fathead minnows): Environmental Toxicology and Chemistry 16, p. 2009-2019.